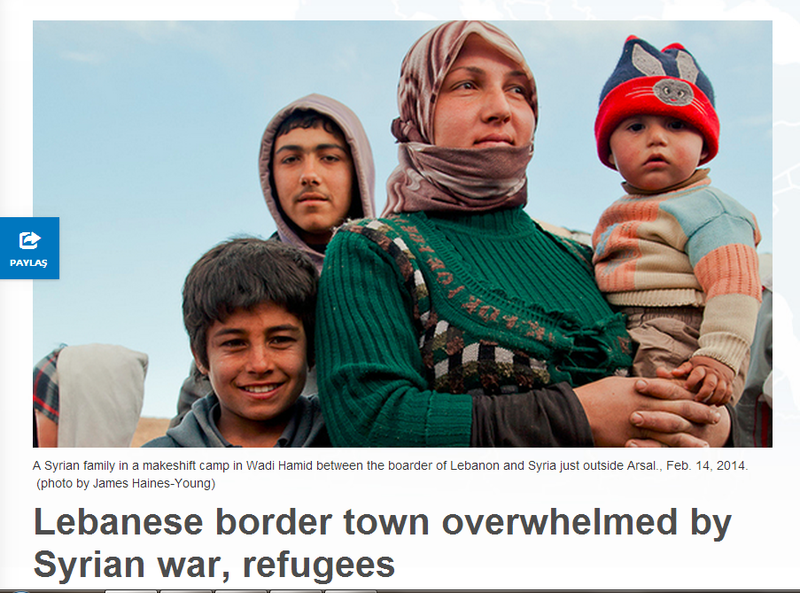 The refugees began flowing into town soon after the Syrian conflict erupted in 2011. Arsal had always been a transit point and job site for Syrian laborers, so many of them decided to settle there to wait out the crisis. When clashes in Syria began to rock the border areas — particularly during the 2013 spring battle of Qusair, that winter’s fighting in Qalamoun and the recent clashes in Yabrud this month — the number of refugees in Arsal rapidly increased. “The effects certainly aren’t positive,” said Ahmad Fliti, the town’s deputy mayor. He looked tired and spoke at lightning speed, trying to get as many words in before having to answer one of the myriad phone calls from Arsal’s residents, government figures and aid agencies. The Office of the United Nations High Commissioner for Refugees (UNHCR) has put the total number of refugees it has assisted in Arsal at 50,000. Fliti, citing makeshift camps on Arsal’s outskirts beyond the UNHCR’s reach, said the total refugees overall is closer to 80,000. He said the town’s electrical grid, waste management system and water supply are struggling to serve a population almost three times its original size. “There are enough water tanks and electricity centers in Arsal for 35,000 people,” Fliti told Al-Monitor. “There are now over 100,000 people using them.” Power cuts and water shortages are common throughout Lebanon, but have become endemic in Arsal as the town’s shaky infrastructure creaks under the ballooning population. Lebanese residents, and those Syrians who can afford to rent cheap apartments, have been forced to ration water usage. At least five of the town’s generators and power centers have been rendered dysfunctional by the overwhelming number of people attempting to use them. Repeated requests for the state electricity company to repair them have been to no avail. The government’s lack of apparent concern, Fliti said, has become the norm. “As a municipality, we have presented projects to the government for additional support in electricity, water and health, but we haven’t received a response,” he said, shrugging. The Ministry of Social Affairs had only recently reached out to Arsal, but only to coordinate among aid agencies, not to provide their support to the town’s Lebanese residents. The Arsal municipality and its local partners have for months been struggling to fill the federal government’s role, buoy morale and stave off the sense of isolation felt by village residents. Capacity-building programs funded by UNHCR and implemented by the UN Development Programme (UNDP) have tried to alleviate some of Arsal’s overwhelming needs. UNHCR has thus far donated a school bus, an ambulance and a waste management truck, according to Lisa Abou Khaled, the agency’s Arsal representative. “The UNDP has provided support, but I have to be honest,” Fliti said. “It’s been very meager. Four to five cars aren’t enough.” Further complicating the UN’s work in Arsal is the worsening security situation along the border area, which led to international aid agencies being evacuated from the town the preceding week. Now, with even less contact with agencies helping to support the town, residents’ feelings of frustration and abandonment are mounting. Some of their frustration is being taken out on the refugees. Abu Khaled al-Omar, an elderly Syrian man from Homs who has been renting an apartment in Arsal for the past nine months with his children and grandchildren, has not had positive interactions in the dusty little town. “People in Arsal are cruel toward us as Syrians,” Abu Khaled lamented. “We have been here almost a year, and people won’t even say hello to us in the street.” Fliti said some of the more serious points of contention have arisen from competition over the town’s few employment opportunities. “Most of the jobs in Arsal are low-skilled jobs, and these are the tasks that Syrians can do — barbers, electricians and so on,” Fliti said. As refugees pour in, they employ fellow Syrians and offer their services for much lower fees than Lebanese workers command. In January, some of Arsal’s residents, complaining of being driven out of the market, threatened to attack Syrians unless they shut down their businesses. The municipality has played a mediating role, calming tensions and attempting to bring refugees and residents together to successfully share Arsal’s work opportunities. Feelings of aggression, however, are undeniably on the rise. Carol Maalouf, a veteran journalist who now oversees some refugee camps outside Arsal, said that although residents have mostly been welcoming, their patience is increasingly wearing thin. “A lot of the people in Arsal blame the Syrians for their plight,” she observed. “They say, ‘We were living a quiet life before, and now it’s very busy with traffic, construction trucks and so on.’” In an area with limited resources, residents are also resentful toward refugees for their apparent opportunism. “We found refugees who live in our camp as well as another one. This way, they double the aid, and they sell what’s left,” Maalouf asserted. As fighting in Yabrud intensifies, and with Arsal being one of the few remaining open border points with Syria, refugee flows into the town will not be stemmed anytime soon. The scarce resources and strained infrastructure are likely to exacerbate issues between Lebanese residents and Syrians rather than ease them. It thus looks as though one of Lebanon’s most war-affected towns will continue to cope with the Syrian spillover almost entirely on its own.